Not all used window related problems require a full window replacement. For newer homes, well maintained homes and those with relatively new windows, window replacement is usually the most expensive and unnecessary option. In case you are wondering, when it comes to old or broken windows you generally have the choice to reglaze, retrofit, or replace. Let’s take a look to see which one is right for you.As we have already touched on retrofits and full frame window replacements, today we will focus on reglazing. In short, reglazing is window pane replacement. This is a more cost effective solution but is also more of a temporary fix, as older windows usually have problems that go beyond the glass. When do you want to consider reglazing as an option to enhance the performance of your home windows? Reglazing should be opted for when the rest of the window unit is in good condition. This means that the window sash is sturdy, moves well, and is still air and water tight. The frame should also be free of cracks, breaks, and rotted wood. If this is the case, then all you need is new glass. More often than not, reglazing will not work for older, single pane or aluminum windows. The reason for this is the thickness of the glass unit. In single pane (and double pane) windows, the window sash was made to hold only a specific number of panes. 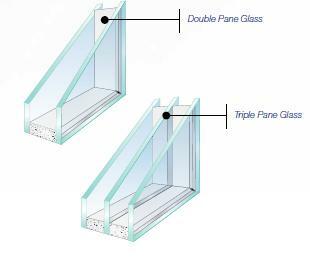 Thus, if you are looking to upgrade to double or triple pane windows, the larger unit simply would not fit. New windows are available with double and triple pane glass, insulating glass spacer technology and argon gas. Not only will it not fit, but chances are it will not solve the problem either. No matter how good the condition of the window frame appears to be, the contents of the wall will make all the difference in the performance and longevity of vinyl windows. This means that usually insulation is either missing or defunct by this point. Older windows often also have problems with rotten wood and building materials that are not visible until the existing window is removed. While replacing just the glass will save you money by limiting the amount of heat lost through conduction and convection, it will not address the sizeable amounts of heat lost through the cracks around the window or damaged frame and wall components. One of the reasons why homeowners think it’s time to change their windows is condensation on glass. This is an issue for both new and older homes alike. In a well-installed window, in a properly maintained in-home environment condensation is caused by the sealed unit failure. What this means is that the membrane that joins the two or three panes together (and in some cases keeps argon gas inside) has been punctured and is now letting moisture inside the glass. If the warranty still applies and the window company is still in operation, the best solution is to ask for a replacement. The other cause of condensation is the presence of higher than normal amounts of humidity inside the home. As we have mentioned earlier, Energy Star has come up with target humidity levels for specific outdoor temperature ranges. If humidity is higher, you will have condensation – replacing the glass will not make a difference. Why Does Condensation Occur on NEW Windows and Doors? The above information should definitely give you something to think about. To make a decision you should make an honest assessment of your windows. Are they drafty? Are they cold? Do they freeze? Do they leak? These and countless other questions should be considered in your assessment. Once you have your answers, you are ready to take action. If you decide to replace your windows consider getting quality product that is ENERGY STAR rated and the company performs work to CSA standards. Or maybe you need our help with this? Is It Worth It? Used Windows: Reglaze, Retrofit or Replace Overall rating: 4.9 out of 5 based on 41 reviews.